In publishing and library and information science, the term serial is applied to materials "in any medium issued under the same title in a succession of discrete parts, usually numbered and appearing at regular or irregular intervals with no predetermined conclusion." The ISSN system was first drafted as an International Organization for Standardization (ISO) international standard in 1971 and published as ISO 3297 in 1975. ISO subcommittee TC 46/SC 9 is responsible for maintaining the standard. Media are the communication outlets or tools used to store and deliver information or data. The term refers to components of the mass media communications industry, such as print media, publishing, the news media, photography, cinema, broadcasting, and advertising. A regular expression, regex or regexp is a sequence of characters that define a search pattern. Usually this pattern is used by string searching algorithms for "find" or "find and replace" operations on strings, or for input validation. It is a technique that developed in theoretical computer science and formal language theory. Separate ISSNs are needed for serials in different media (except reproduction microforms). Thus, the print and electronic media versions of a serial need separate ISSNs. Also, a CD-ROM version and a web version of a serial require different ISSNs since two different media are involved. However, the same ISSN can be used for different file formats (e.g. PDF and HTML) of the same online serial. An ISSN can be encoded as a uniform resource name (URN) by prefixing it with "urn:ISSN:". For example, Rail could be referred to as "urn:ISSN:0953-4563". URN namespaces are case-sensitive, and the ISSN namespace is all caps. If the checksum digit is "X" then it is always encoded in uppercase in a URN. A unique URN for serials simplifies the search, recovery and delivery of data for various services including, in particular, search systems and knowledge databases. ISSN-L (see Linking ISSN below) was created to fill this gap. 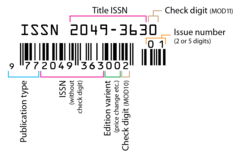 The ISSN-L is one ISSN number among the existing ISSNs, so, does not change the use or assignment of "ordinary" ISSNs;  it is based on the ISSN of the first published medium version of the publication. 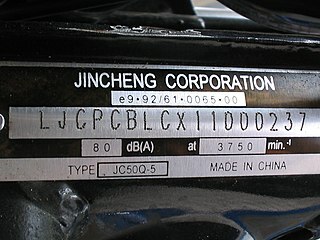 If the print and online versions of the publication are published at the same time, the ISSN of the print version is chosen as the basis of the ISSN-L.
A vehicle identification number (VIN) is a unique code, including a serial number, used by the automotive industry to identify individual motor vehicles, towed vehicles, motorcycles, scooters and mopeds, as defined in ISO 3779 and ISO 4030. 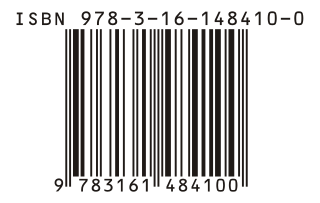 The Electronic Product Code (EPC) is designed as a universal identifier that provides a unique identity for every physical object anywhere in the world, for all time. The EPC structure is defined in the EPCglobal Tag Data Standard, which is an open standard freely available for download from the website of EPCglobal, Inc.. The canonical representation of an EPC is a URI, namely the 'pure-identity URI' representation that is intended for use when referring to a specific physical object in communications about EPCs among information systems and business application software. The EPCglobal Tag Data Standard also defines additional representations of an EPC identifier, such as the tag-encoding URI format and a compact binary format suitable for storing an EPC identifier efficiently within RFID tags. The EPCglobal Tag Data Standard defines the structure of the URI syntax and binary format, as well as the encoding and decoding rules to allow conversion between these representations. The EPC is designed as a flexible framework that can support many existing coding schemes, including many coding schemes currently in use with barcode technology. EPC identifiers currently support 7 identification keys from the GS1 system of identifiers, as well as a General Identifier and EPC identifiers that can be used for encoding supplies to the US Department of Defense. ISO 6346 is an international standard covering the coding, identification and marking of intermodal (shipping) containers used within containerized intermodal freight transport. The standard establishes a visual identification system for every container that includes a unique serial number, the owner, a country code, a size, type and equipment category as well as any operational marks. The standard is managed by the International Container Bureau (BIC). ISO/IEC 6523Information technology – Structure for the identification of organizations and organization parts is an international standard that defines a structure for uniquely identifying organizations and parts thereof in computer data interchange and specifies the registration procedure to obtain an International Code Designator (ICD) value for an identification scheme. The International Standard Music Number or ISMN is a thirteen-character alphanumeric identifier for printed music developed by ISO. 1 2 "What is an ISSN?". Paris: ISSN International Centre. Retrieved 13 July 2014. ↑ "Collection Metadata Standards". British Library. Retrieved 14 July 2014. ↑ "ISSN, a Standardised Code". Paris: ISSN International Centre. Retrieved 13 July 2014. ↑ "The ISSN for electronic media | ISSN". www.issn.org. Retrieved 2017-09-28. ↑ Example of database implementation where seven-digit integers are used to store ISSNs. ↑ <rozenfeld@issn.org>, Slawek Rozenfeld. "Using The ISSN (International Serial Standard Number) as URN (Uniform Resource Names) within an ISSN-URN Namespace". tools.ietf.org. ↑ github.com/amsl-project/issn-resolver See p. ex. $pattern at source code (issn-resolver.php) of GitHub. ↑ "Online ISSN Checker". Advanced Science Index. Retrieved 14 July 2014. ↑ "Online ISSN Validator". Journal Seeker. Retrieved 9 August 2014. ↑ "Total number of records in the ISSN Register" (PDF). ISSN International Centre. February 2017. Retrieved 23 February 2017. ↑ "ISSN for Electronic Serials". U.S. ISSN Center, Library of Congress. 19 February 2010. Retrieved 12 July 2014. 1 2 "The ISSN-L for publications on multiple media". ISSN International Centre. Retrieved 12 July 2014. ↑ Rozenfeld, Slawek (January 2001). "Using The ISSN (International Serial Standard Number) as URN (Uniform Resource Names) within an ISSN-URN Namespace". IETF Tools. RFC 3044 . Retrieved 15 July 2014. ↑ Powell, Andy; Johnston, Pete; Campbell, Lorna; Barker, Phil (21 June 2006). "Guidelines for using resource identifiers in Dublin Core metadata § 4.5 ISSN". Dublin Core Architecture Wiki. 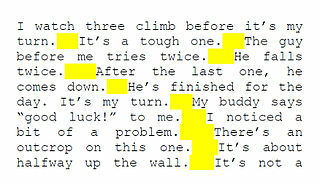 Archived from the original on 13 May 2012. ↑ "MEDLINE®/PubMed® Data Element (Field) Descriptions". U.S. National Library of Medicine. 7 May 2014. Retrieved 19 July 2014. ↑ "Road in a nutshell". Road.issn.org. Archived from the original on 5 September 2017. Retrieved 12 September 2017.